As the name implies, polymorphous low-grade adenocarcinoma (PLGA) is a low-grade neoplasm consisting of a uniform population of tumor cells that are arranged in a variety of architectural patterns (polymorphous). It has previously been known as terminal duct carcinoma, lobular carcinoma, and low-grade papillary adenocarcinoma. The median age at presentation is in 6th and 7th decades with a female predominance. Locations: It primarily involves minor salivary glands of the oral cavity. Almost two-thirds of cases are located in the palate. It is the 2nd most common type of salivary gland carcinoma in this location after adenoid cystic carcinoma. It may also involve buccal mucosa, upper lip, base of tongue, and retromolar region. Uncommon locations include major salivary glands, lacrimal gland, nasopharynx, and nasal cavity. PLGA may occur as a malignant component in carcinoma-ex-pleomorphic adenoma. Microscopic Features:At low magnification, PLGA appears well-circumscribed but is unencapsulated with a distinctly infiltrative appearance at its periphery. 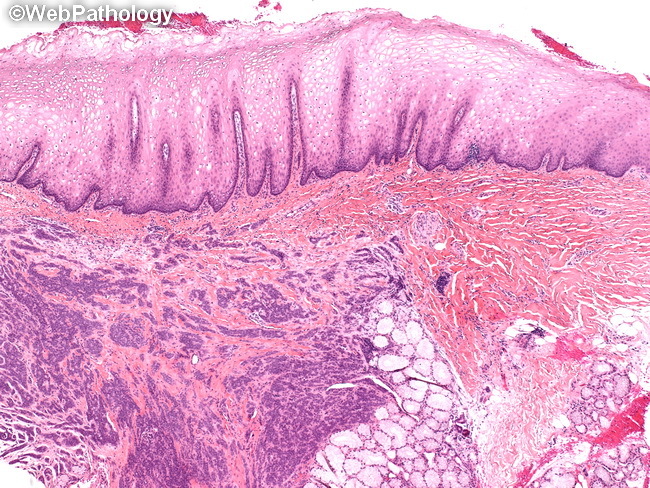 The tumor shown here was located in the palate. Note the entrapped residual minor salivary glands on the lower right.